You did surprise us all with a wonderful show, and a completely fresh setlist. The half-acoustic set with Rick on the �Baby-Grand� was most enjoyable. 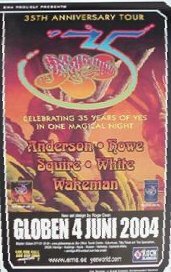 Mr Wakeman: You are certainly not to old, and you convinced me that it wasn�t your �bum� on the 1977 Tour Programme. Chris: Sorry about your tongue, I was curious about the state of your right hand thumb. Alan & Steve: Did not get the opportunity to speak with you, maybe next time? Jon: Sometime I would love to have a conversation with you about life and things beside your lovely music. Stay well and keep on sharing your magnific music�. It's right for me, and the time is now. 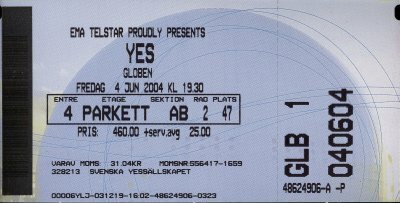 So Friday night was the Big Event, only the second time in 20 years that Yes have visited Stockholm. Last time, in the fall of 2001, I had a heady couple of days as I got to be treated to a beer by Alan White, see the band rehearse "Magnification" and spend 15 minutes talking to Jon and Janee. 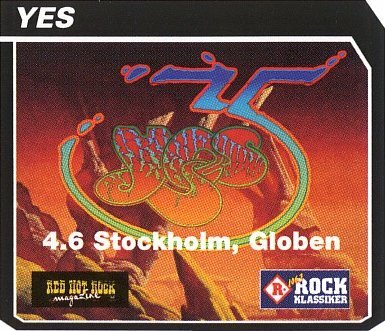 Alas, this time, no such special happenings occurred, although as I visited the Swedish Yesfan gathering held in the Sheraton where the band was staying, I did run into Rick at the hotel bar and wished him a good gig that evening. All of the band members did make appearances at the fan gathering (albeit in Chris's case for 30 seconds), but since they were immediately engulfed by autograph hunting throngs, I kept my distance. So, the concert. I had less than ideal seats, stage left, fourth row up. I ended up there after my boss had told me not to buy tickets cause he "could get some really good ones". Ahem. Anyway, I knew nothing of the set list, bar the fact that GftO was the opener. That went off well, and the new arrangement of Sweet Dreams was pretty nice, although I missed the harmonies. So far, so good, but obviously confusing to 90% of the crowd, who I would guess were neither diehard fans nor too up on the band's back catalog. So, some meat was tossed to them in the form of YM/ISaGP. During the latter half, I left my seat to guy buy a Yes baseball cap (and also to avoid being violently ill, natch). I was eminently surprised to hear Mind Drive starting up, and hoped against hope that it had been rearranged to give it some substance. Nope - but at least it was split in two, which kind of saved this overrated piece. At this point, all three of the people I hade come with were very confused about what all these odd songs were, and I'm sure they were far from alone in this. Here's the band going on a 35th anniversary tour, playing to bigger crowds than they have in a while, and they put together a very ecletic die hard fan-friendly set. Odd, but pleasingly brave. After YiND, it was time for a break,and out in the smoking area, there was some speculation as to what we could expect of the second half. The people I spoke to were by and large asking for the long form stuff from the Main Sequence. I was happy that with ISaGP out of the way, it could only get better. I was wrong - dead wrong. When I realised that we were going to be treated an acoustic set, I was dismayed. If the shuffled-to-death stiff-as-a-board version of Roundabout that is featured on the 35th anniversary CD was anything to go by, this was going to be painful. 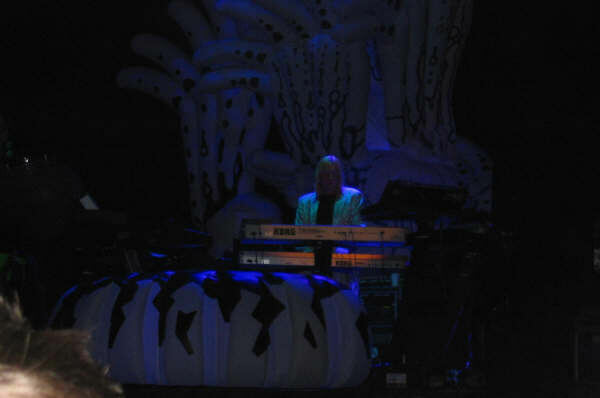 And so it was - Wakeman may be a skilled synth player (although one with some really unfortunate sound choices and a very limited number of solo tricks), but as a piano player, he is just plain awful. His intonation is completely insensitive, and he just bangs away at the keys with a total lack of finesse. It's as if he thinks he's playing an organ or synth, not realising what it is that comes out of the speakers. To pull off a stripped down set like this, a band needs to have a special kind of groove, one that Yes does not possess at all. The only highlight was OoaLH, because this was a good way to get this must-be-played tune out of the way in a mildly interesting way. But the rest: snoozeworthy. If I want to see some aged troubadours, I can go to the pub on the corner. At one point, I leaned to my bench mate and asked, "If I go outside, will you call me when Yes come back?". I guess they should get props for trying new things, but those things should be held within the capabilities and limits of the band. Encore: Starship Trooper. Lots of solo riffing, nothing transcendental. A firmly workmanlike effort. It was just as good as one can expect. Steve was very animated and enjoyed himself. Not even his small mistakes in some songs seemed to distract his mood. Jon sang as only he can do, Rick was hot, Alan, this nice guy, was smoking and Chris - Chris was ON FIRE! Go see the show! It is magic brought alive!!! saw the 4-30-04 sunrise florida show! great seats, just above the stage, saw everything......and better yet, days later we heard a super recording of the following day tampa show from a GOOD friend......thanks pep!! as far as the overall sound-the band, the mix was a little lop sided, but it did get better as the band played on!! there was hell of alot more back up singing goin on, but the mix was a little off, jon could be a tad louder, where as steve's vocal could be a tad lower!! and then goin straight to the show! !we'll have our minds in the right part of the beautiful sky of stockholm!! !